5 Canadian National Railway cars filled with grain derailed near the 11th Street bypass in Saskatoon, Saskatchewan December 13 (Global News), only 16 hours following a major derailment of 35 cars near Raymore, Saskatchewan December 12. The Raymore derailment involved one car carrying isopropanol alcohol (a dangerous good); 22 cars carrying new automobiles which were damaged; and the rest carrying steel, canned goods and mineral oil (Regina Leader Post, CBC News, CJME). 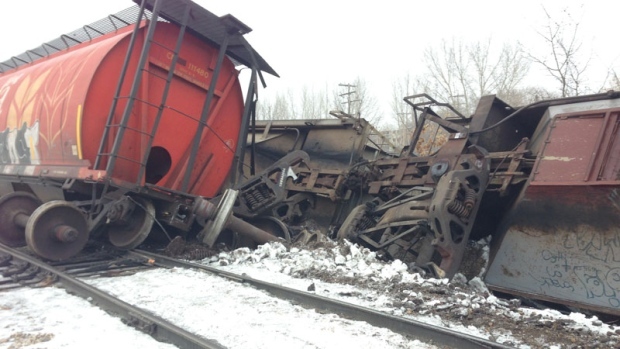 “CN Railway Derailments, Other Accidents and Incidents” cites many more CN derailments in Canada and the U.S.
~ by railroaded on December 14, 2014.